Really nice and clean ride! Congrats on your purchase and welcome to the family! Congrats, nice looking car. How would compare the GC to your old e30? E30 has been a chassis I have been looking at. That's an interesting question. The main difference is the AWD/RWD variation between the two. I feel much more confident in the RS of course, but the E30 had a much more refined interior in my opinion that was very ergonomic and driver focused. The RS does this but not as much as the E30. My E30's handling was on par with the RS now, very planted in the corners and very preditcable, but that's comparing coilovers to standard RS suspension. Of course powersliding is a blast in the E30. In all there's a 10 year difference in age from my E30, which was a slower 318iS but with a ~2500lb curb weight. They're a very capable and easy to work on car. Its much, much harder to get into one now than when I got mine in 2003. If you have any more specific questions I can try and answer them, or head to R3Vlimited forums for more. I was on there for many many years. Got my winter wheel setup together! 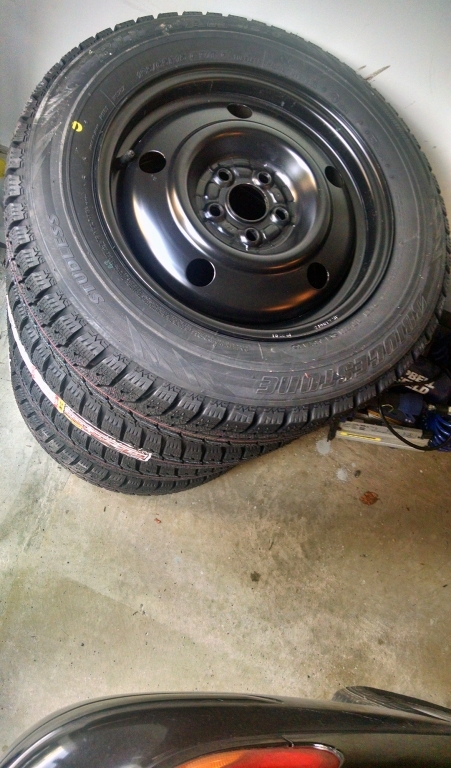 Found the Subaru steelies new in their boxes with the part numbers off craigslist, and the winter tires are Blizzak WS70's. Looking to remove the spoiler and find appropriate plugs for the holes as well, took measurements of everything earlier. I'll be moving soon so I won't have my garage! I am saddened. Regardless I did have another question. Anyone out there who has the ORIGINAL key and alarm? Just wondering what came with these from the factory. Cool, thanks for the reply on the RS/E30 comparison. My 2001 RS had a lock/unlock fob like this. The buttons say lock/unlock on them when new...but rub off in like a week. Are you putting a new spoiler on? Or is it going to be a flat deck? I gotta get my hands on that key, I can't find a blank anywhere. Same for the lock/unlock, my car's old alarm keeps going off when I unlock it with the key. For winter I'd like to just plug the holes. For the spring season I want to get my hands on a coupe spoiler but they seem hard to find. Anyways I'm moving this weekend, and I'll be without a garage! I'll have to make the best of it but dammit if I'm not worried about salt this winter eating my car up. Damn, that is an amazingly clean find. Nice! They are hard to find. I plan on putting on an RS wing on my 93 L. Good luck with your search. I'll be watch this build develop. I found the key blank! And its lighted! Lets see how long the light works...I also got a lead on the keyless entry too. All that for OEM goodness, I'm weird like that. Coupe spoiler found, but a bit pricey. I'll wait for a black one to pop up.